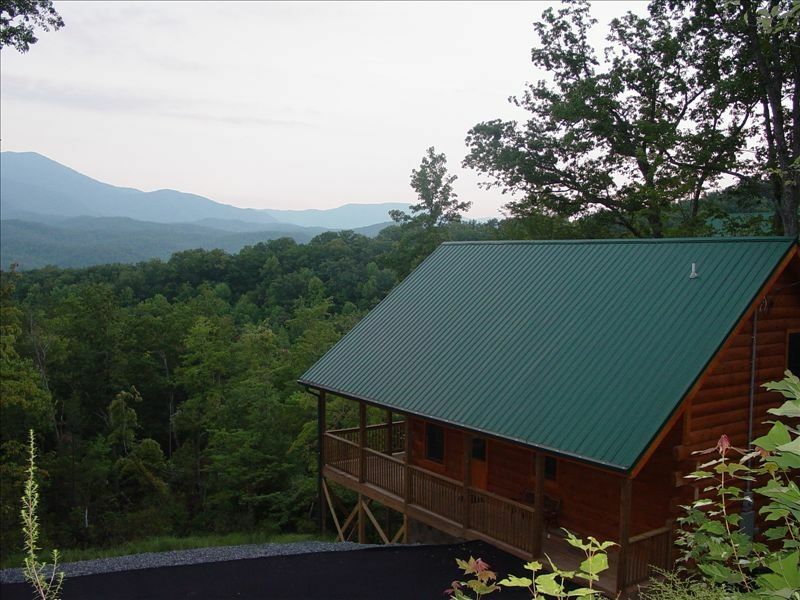 ' LeConte Lookout' Our log home is the retreat that you have been looking for! It has quickly become a favorite among guests, This cabin has 2 king master suites with adjoining baths (one located upstairs and one down),every room has a plasma TV including the loft area. The view of the mountains and Mount LeConte is breath taking, there is no shortage of spots to relax and rejuvenate at this cabin. It has covered wrap around porches with rocking chairs, patio table, large hot tub, a covered balcony upstairs off of the loft area with a love seat, two chairs and a coffee table to rest and absorb the peace and quiet in. It is mostly private and has many extras including a pool table, plasma TV's in every room, Netflix, video now, Vudo etc, stack stone gas fireplace, high speed internet, fully equipped kitchen with stainless appliances, Keurig coffee brewer and beautiful counter tops, leather furniture in the living room, 2 convertible beds, a dining set that will seat 6 at the table and 3 at the bar. This cabin provides all of the comforts of home, the bedrooms have beautiful bedding, plasma TV's and master baths in each of them. Whether you are looking for a weekend getaway or regular retreat to call your own, this is it! We have built our reputation on clean, well maintained cabins, we provide a number of household products for your stay, it is our way of saying welcome and thank you for choosing us! We are local and here to address any issue that may arise while staying at our cabin. Keywords: Luxury log home with all the extras and upgrades including a fantastic panoramic mountain view!!! 'LeConte Lookout' is like New, mostly private and has a fantastic mountain view with many extras and upgrades. Just 5 minutes from down town Gatlinburg. Everyone loves this cabin and all it has to offer. We offer special rates through out the year ranging from $145-$225 a night. It has breath taking panoramic views and peaceful surroundings. This cabin has privacy, peace and quiet and a view that is hard to beat. Covered porches with patio sets, rocking chairs and hot tub, 2 king master suites, plasma tv's in everyroom, stainless appliances, wireless internet and much more. We also provide a dozen bakery style cookies for your stay. Panoramic, unobstructed view of the National Park. All linens, sheets, blankets, towels, kitchen towels etc are provided for your stay. Home theater, Blueray player, FM/ CD player, & ipod dock are a few of the extras this cabin provides for the guests. Our family of four which included two small children loved it! The view was great and the cabin was clean. The kids loved playing pool in the loft. Had a great time! Spent time in hot tub, played pool, enjoyed the view. Kitchen had everything we needed! Very nice cabin. Super clean. Would stay again. Very clean and nice. Wonderful views. Great location, very clean, lovely interior! Owner Christy great to work with, and allowed us early access upon our arrival. This cabin will absolutely go on our "to visit again" list. My husband and I enjoyed staying at this cabin. The view of the mountains were beautiful from the upper and lower decks. We would stay here again! This property is just moments away from the area attractions, wood working, carving, candles, restaurants, jewelry, art, paintings, etc in the Arts & Crafts Community. It is convenient to hiking, horseback riding and down town Gatlinburg all with in 5 minutes from the cabin. We offer specials through out the year please call to get an exact quote for your stay. Our prices vary through out the year. Low $115 -Mid $155 and Peak $225.